Today, in our Color Crush series, we're highlighting one of my favorite metallic-Copper! A very "now" metallic that looks great paired with moody blues, berry colors and earth tones. Let's explore some of my favorite Copper finds! 1. From West Elm, this set of Copper Cook's Tools are as functional as they are beautiful! 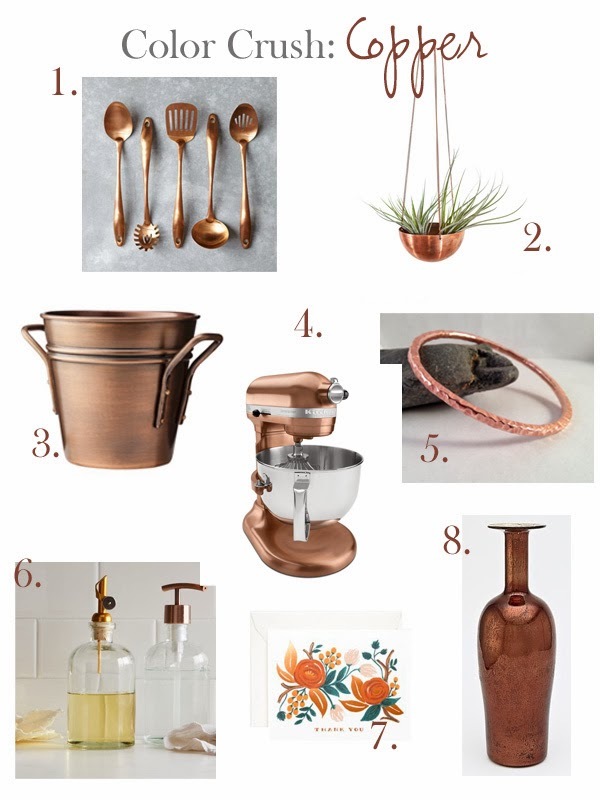 Perfect to add a touch of copper to your kitchen without going overboard. 2. This stunning copper hanging basket is hand made and a gorgeous way to add some metallic style to your space! 3. This indoor/outdoor copper planter is the perfect way to add some subtle copper flair to your home or yard. Want to gussy it up a bit? Head to Belvedere Designs and order some vinyl house numbers or a favorite word or phrase to add even more style to this fun piece. 4. Seriously adore copper? Ready to dive head first into the copper craze? This KitchenAid Stand Mixer is the ticket, and would look perfect in any style kitchen! 5. Copper jewelry is the latest trend, and this simple copper bangle is handmade and undeniably elegant. 6. These copper-topped soap dispensers are simple, modern and just lovely! 7. These copper floral thank-you notes are perfect for saying thank you in style-perfect to gift or have on hand so you never have a reason not to show your gratitude. 8. This elegant copper mercury glass vase is the perfect addition to a bookshelf, mantle, or dresser. You can get it in other finishes as well to create an instant collection!